Good weather (for a change) heralded our umpteenth Autumn Show at Capel Manor. Twenty top class individual trees were on display, together with Club displays from North London, Middlesex and Mid Herts Clubs. 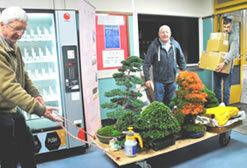 A number of traders plied their wares, including Kaizen Bonsai, Reid Bonsai, Walsall Ceramics and Lee Verhorevoort, who also supplied a tree for the raffle. We waited with a degree of anticipation for the hall to open early on the Sunday morning; all soon changed to what appeared to be organised chaos as people struggled in with large trees and barrows stacked up with all sorts of Bonsai items. I even saw one large tree being brought in on a stretcher arrangement. 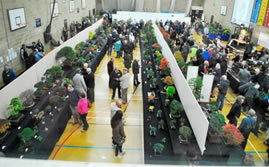 By 9.30am when we had the group picture taken, the hall had been transformed with rows of club displays and numerous traders set up around the hall. Having been involved with the show from its humble beginnings, my thoughts went to the problems we had in arranging this year’s show. We could not get agreement to use the school we had used for a couple of years and an alternative location could not be found; we were coming to the conclusion we might not be able to have a show. Out of the blue I received a phone call from Mark - could I meet him and other members of the team at Harlington Sports Centre. When we viewed the hall it looked so large; would we able to fill it out for a show? We decided to go with this location. On the day of the show we realised our doubts were unfounded. To stage a show of this size requires tremendous efforts. The leadership comes from Mark and Ming and a core group of people who form the team who put the show together. They were there on Saturday setting up and after the show clearing away; anyone else who stayed on to assist with breaking down show thanks, the hall was cleared by 5.30. A sincere thanks to the team and everyone who made this year’s show such a success. 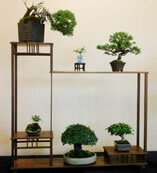 There were club displays from 34 Bonsai clubs coming from far and wide with a range of trees from very large to some very small. There were some displays with many trees and some with a very minimal number of trees. When you looked around the quality of trees and displays was very good, it has improved year on year. This show is a club show; everyone is given the same size display area and can stage their display as they want. We feel this concept for the show gives an opportunity for clubs to see variations of displays and standards of trees.. Apart from a couple of fun competitions for the visiting public and club members to vote for the tree that appeals to them, we have resisted the competitive element that is apparent at other shows. Throughout the show we collected for the Royal British Legion Poppy Appeal. This was supported by Andy Pearson from Stone Monkey Ceramics who generously made and raffled one of his pots, and with the collection on the day we raised £853.60. 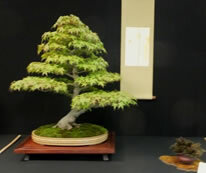 There was a large group of Chinese Elms on an extremely large slab that had been put together by Johnny Gires and was set out with a remembrance garden within the display whilst this display was not part of the competitions on the day it did received a lot of favourable comments. Traders at the show selling a vast selection of bonsai items provided the opportunity to purchase a wide range of goods .Many visitors were seen carrying their newly acquired trees away. Will Baddeley carried out an interesting demo throughout the day. It is surprising what you can achieve with some raffia wire and vision and a certain amount of artistic interpretation. 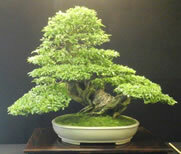 People talk of the friendly atmosphere at the show; we are sure this comes from the opportunity for Bonsai enthusiasts to show their trees in a general relaxed club atmosphere. Around 500 paying visitors came to the show. There is already talk of next year’s show and we have even more clubs wishing to come. Thanks once again to all who supported our show this year and we hope to see you all again on Sunday 22th October 2017 at the same venue. 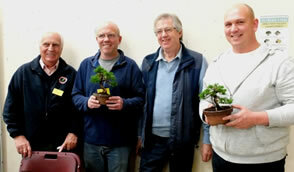 The winners of the tree competitions can be seen on the Heathrow Bonsai Show website www.heathrowbonsai.weebly.com . You can also find a list of all clubs and Traders who took part in the show. The qualifying heat for this year’s Amateur New Talent contest took place at the Heathrow Bonsai Show. There were two contestants, Duncan Heild and Bill Hallworth. 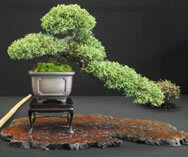 Over a three hour period, both worked on very similar Chinese junipers. Both showed a high standard of competence, making judging difficult. In the end, it was Duncan Heild who won by a narrow margin and he will now represent the United Kingdom at the European Bonsai Associations’ Congress, held next February in conjunction with the XVIII Noelanders Trophy in the Belgian town of Genk. Congratulations to both contestants and our best wishes to Duncan in the Final. May I draw your attention to the FoBBS Annual General Meeting, taking place at the Birmingham Botanical Gardens on Sunday, 12th March 2017 at 11.30, following the Bonsai Boot Sale organised by the Friends of the National Bonsai Collection at the same venue. Details of the meeting together with membership forms will be sent out to societies during the latter part of November. This mailing will also include nomination forms for both the FoBBS and FNBC Committees. Of the current committee, many have given of their time for some years. We are looking additional members to take on specific roles or at least assist with specific tasks involved in the running of an organisation. None of this is arduous - in fact, people find it enjoyable and rewarding. We are looking for volunteers; anyone interested, please contact me before the end of November and I will be happy to discuss what is involved. We need new blood – we cannot carry on forever! !